Our Air Cleaner Removes 99.99% of Dust & Allergens from the Air You BreatheRemoves 99.99% of the Dust from the Air You Breathe!Removes 99.99% of Dust & Dust Mites! Dust mites are among the most common factors contributing to household allergies and are a root cause of asthma symptoms, such as wheezing. To help alleviate the suffering a dust mite can inflict, Rocky Mountain Air® has created the Summit air purifier to stop dust mites at their source. By utilizing seven (7) stages of air purification, our air cleaners are able to remove 99.9% of all dust, allergens, and bacteria from the air you breathe. Asthma and allergy sufferers will be amazed at the results! In fact, the Summit also provides UV sterilization to help sanitize the air in your house and kill dust mites in the process. 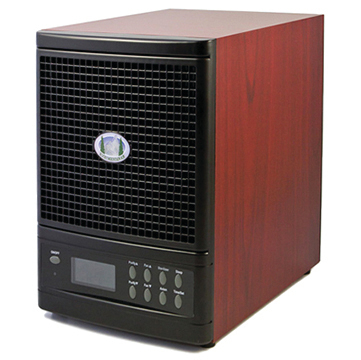 Because each HEPA certified unit removes dust from up to 3,500 square feet of space, the Summit is considered to be the ultimate anti-dust air purifier. Even owners of large homes will see the benefits that best-in-class dust removal can offer. Never again will you have to worry about the allergy trouble dust mites can cause. Our dust air purifiers will provide fresh and clean air for your entire family. The Summit air purifier use Seven Stages of Air Purification to remove dust and kill dust mites. By combining Ultra-Violet santizion with HEPA filtration, our air purifiers for dust provide dust control for your home at the push of a button. Seven Stages Of Purification: Ultraviolet (UV) SterilizationEach air purifier by Rocky Mountain Air® features ultraviolet sterilization to make your home or office safer by sanitizing the air you breathe. Our air cleaners contain dual UV lamps to, with each purification cycle, kill microorganisms, such as viruses, bacteria, mold, and mildew. Ultraviolet Germicidal irradiation (UVGI) is an important addition to any HEPA air filter, as UV lamps are known to kill 99.9% of microorganisms they come in contact with. The combination of UV sterilization, HEPA filtration, and our other four purification stages make Rocky Mountain Air® purifiers an essential means of keeping the air in your home safe and clean.